Create and save your searches, and then if you choose we will email you the results. We update from the MLS throughout the day, and if a new listing that matches your search is just listed, you will receive an email with the listing´s info. Or just save your search and check back by clicking "go to saved searches" in the Just Listed Email update page. To try it out click here! with straight talk, and second to none personal attention to your needs. Don´t see the home you want? Call us. We can show you ANY home from ANY realtor. Let us help make your new home search easier and faster. Located at 565 maple Street, WRJ, VT. and founded in 1997 by John Clerkin and William Clerkin. The company's roots trace back to a long line of agencies founded in the 1950's. You will find thousands of properties for Sale this easy to use website! 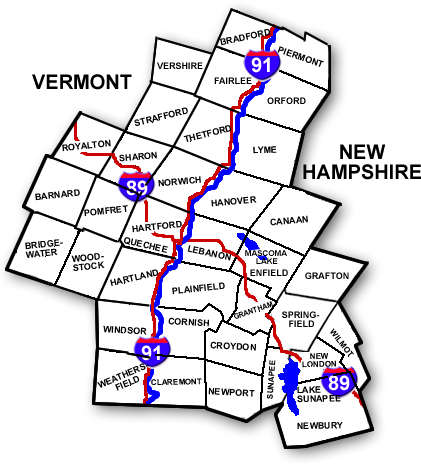 Our market extends to the "Greater Hartford Vermont area" including: Hartford, Sharon, Hartland, Windsor, Thetford, Norwich, in Vermont and Hanover, Lebanon, New Hampshire. We are a full service Brokerage. In addition to Home sales and purchases, we handle a considerable volume of land, condominium, and multi-family sales. Two of our brokers also serve commercial real estate needs. The Clerkin Agency is a member of New England Real Estate Network (MLS) and all of our associates are members of the National, State and Local Realtor Associations. Our associates have a combined total of 93 years of sales experience in our local marketplace. Click town name to see Homes. These are our newest listings. $289,000 Nashua NH Home For Sale This property features 4 Bedroom and 2 Bath/s. Adorable 4 bedroom 2 bath Cape Style Home, in desirable development off Main Dunstable Road. Much more spacious than it looks! Plenty of space &amp; storage. A wood burning fire place, updated kitchen &amp; windows as well as a nice deck with fenced in yard make this home very warm &amp; inviting. 2 Bedrooms are on the main floor. Large level fenced in back yard encourages children &amp; others to play or relax. Fantastic for Barbecuing! Plenty of room for a pool. This home features a full unfinished basement with endless possibilities, make it your own: Customized office or additional family room etc. Convenient to rural back country roads leading to quaint quintessential NE town of Hollis, State Parts, Mines Falls &amp; Major Highways making this as Spectacular Commuter Location. Won't last. Showings begin on Friday April 26, 2019 Public Open House Saturday April 27, 2019, 9am to Noon. This Listing was entered in the MLS on Apr 25, 2019. See 35 Images . $324,900 Derry NH Home For Sale This property features 3 Bedroom and 3 Bath/s. This Listing was entered in the MLS on Apr 25, 2019. See 16 Images . $139,999 Franklin NH Home For Sale This property features 4 Bedroom and 2 Bath/s. This Listing was entered in the MLS on Apr 25, 2019. See 26 Images . $139,999 Franklin NH Home For Sale This property features Bedroom and 0 Bath/s. $825,000 Portsmouth NH Home For Sale This property features 4 Bedroom and 3 Bath/s. This Listing was entered in the MLS on Apr 25, 2019. See 29 Images . 5 Land building lots listed in the MLS since Dec 26, 2018 for sale.